Australian stationery store chain Typo has 12 locations in Singapore, including one shop at Bugis Junction mall (201 Victoria Street). 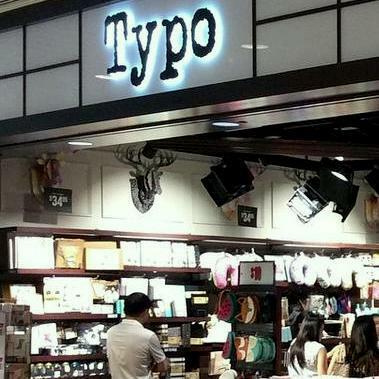 Owned by Cotton On, Australia’s largest fashion group, Typo sells stationery products that allow you to define any personal space with your unique style. Typo operates as a one-stop-shop concept, where you can find supercool gift ideas, fashionable stationery, delightful room-bling, and many other irresistible products. A typical Typo product injects fashion into the stationery classics. …journals & notebooks, pens & pencils, office supplies, diaries & planners, tech, travel supplies & bags, crafts, homewares & lighting, and party supplies. Typo shops have an official brand Facebook page, located at www.facebook.com/typoshop/. The Facebook page is a great place to get inspiration and to learn more about the available products at Typo stores.